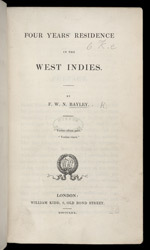 This is the title page of Frederick Bayley's 'Four Years Residence in the West Indies.' Bayley's father was a soldier and took his family with him to the Caribbean when he was called up for service in 1825. Frederick was then 18 years old and a keen observer, and wrote about his journey and experiences in the islands.